Vivekananda Kendra’s Prant Vyavastha Pramukh Sri Bhaskar Sharma, speaking on the occasion of Sister Nivedita’s 150th Birth Anniversary, said, “Sister Nivedita, though a foreigner, had dedicated her life for India, the young students should learn and get inspired to do the same and more for their country”. 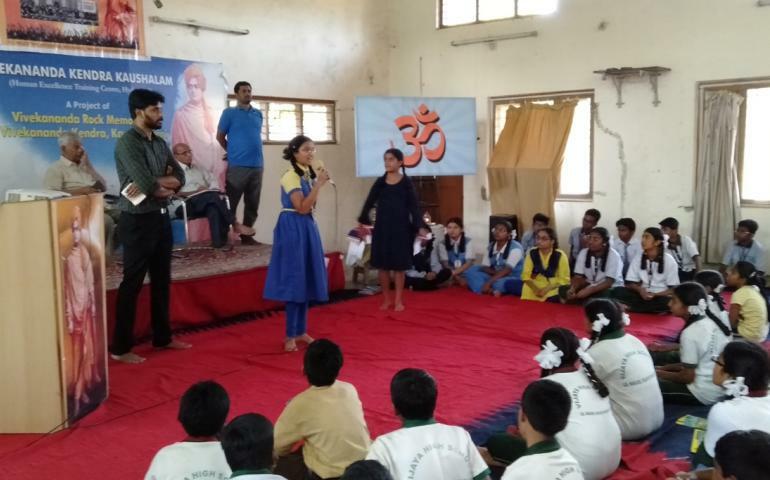 He was addressing 220 students from five schools Sadhana High school, Vijaya High School, The School, Vivekananda High School and Zila Parishad High School from Gajularamaram and Jeedimetla, Hyderabad. The program was organized on 27th October at Vivekananda Kendra – Kaushalam, Hyderabad. Sister Nivedita – the Irish teacher, who on Swami Vivekananda’s call, had left her all – mother land, parents, profession – to serve India, her 150th birth anniversary is being observed this year. Remembering her great contribution for women education, India’s freedom struggle, literature, art and spirituality during a program in Vivekananda Kendra – Kaushalam, the school students resolved to serve the nation wholeheartedly. The students first listen to Swami Vivekananda’s world famous Chicago speech which he had delivered 125 years ago at World Parliament of Religions. Then the students saw a show celebrating India’s Contribution to the world in past and present. The students then discussed these noble thought in their groups and each group representative presented the groups view on strengths India and their duty towards it. Inspired by Sister Nivedita who, in spite of being a foreigner, had dedicated her life for India, students also pledged to do their best for the country. On the occasion, Vivekananda Kendra’s Hyderabad Vibhag Sanchalak Sri Ramarajuji, Vibhag Sanghatak Deepak Khaire Nagar Pramukh Sri Naveen, Communication Expert Sri Bharath Thippareddy and other dignitaries were present.